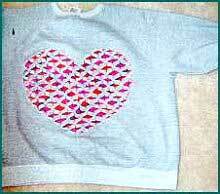 Dress up any plain sweat shirt by using this clothing pattern for a heart. This is a very easy project and you might just enjoy getting your child or grandchild involved. Great seller at craft shows too.